Have you noticed the proliferation of signs outside bars, restaurants and cafes lately, advertising for chefs? It seems that some local Italian, Greek and Indian restaurants are likely to close unless they get someone to do their cooking, according to press reports. Restaurateurs in the UK are having a tough time recruiting staff, with almost half of the vacancies being difficult to fill, according to the UK Commission for Employment and Skills. Indian restaurants are worse hit because they cannot afford to sponsor chefs coming from the Asian subcontinent and as a result, many are expected to close next year. If this continues, we may well find it hard to get an authentic version of popular cuisines on our high street, leaving only the fast food giants to satisfy our appetites. Who is to blame for this shortage of well trained chefs? I put it down to the television shows that have glamourised and given a higher status to the job, when in reality it's a slog. 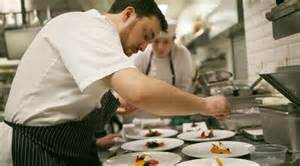 Most chefs work 70 to 80 hours per week, doing split shifts with rarely a weekend off. It is hardly surprising that retaining staff has never been easy. Added to this, youngsters entering chef training are surprised when they find that unlikely their 'hero' on the TV, being a chef means both preparing and cooking food in a small hot kitchen, and washing up all the pans and sometimes the dishes afterwards. My wife, who is a chef lecturer in a catering college, tells me of the surprise on the face of young trainees when they discover that all those pots and pans they have used to perfect their dishes need to be washed and scrubbbed alongside cleaning the kitchen. They never show that on 'Saturday Kitchen'! Likewise many think all their ingredients will be weighted out for them and put into little bowls. They are shocked to discover they need some maths skills to prepare all their own cooking requirements. 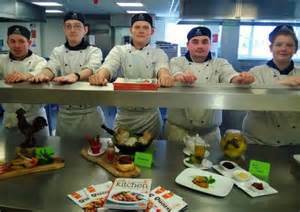 As a result, many young chefs drop out of training early on in their course and certainly after they have tasted a bout of work experience in a local eatery. So if UK youngsters don't want to be chefs or are disillusioned by the reality of the job, why don't we recruit more chefs from abroad? Recent restrictions on recruitment from abroad have made it harder. To obtain a temporary visa for a skilled chef from outside the EU, an employer must pay her or him £29,000 a year, after deductions for food and board. For a permanent visa, the restaurant must pay a salary of £35,000, which is way above the means of most businesses. The industry already relies upon staff from outside the UK, with 40% of current chefs being from outside of the UK, according to the workforce development charity, People 1st. Nearly half of this 40% are from EU countries and Brexit could further escalate the chef shortage. 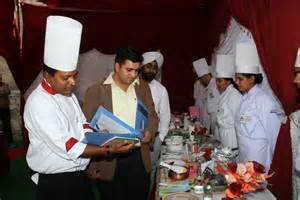 Chefs from abroad are the background of the catering business. So what is the answer? Joanna Blythman, a food journalist and Radio 4 contributor, suggests a relaxation of immigration rules for chefs. However, the UK catering industry reckons it needs to recruit an additional 22,000 chefs by 2022, so Joanne says there are plenty of opportunities for youngsters or retrainers living in the UK. And while for anyone with British citizenship who has fancied a career at the oven, now may well be the time to apply, as the prospects of finding a job will be good, in reality that isn't going to happen, Joanne. My wife's experience of training youngsters tells me that unless the media begin to paint a true picture of the 'day to day' role of a chef to stop aspiring young chefs from expecting to be the next Jamie Oliver, then we can say goodbye to our local Indian, Italian and Greek restaurant and just get a take-away pizza instead!